← Ubuntu 16.04 LTS is here! Owncloud is a popular file storage and synchronization system, with many additional features available for it. It's a self-hosted alternative to systems like dropbox, but with owncloud your files are stored on your own servers. This allows you to meet requirements to keep data in a certain jurisdiction, for example, or it might give you peace of mind to know where your data is stored and who has access to it. Running owncloud means you can keep documents organized in the owncloud repository and have access to them from anywhere, including desktop computers, laptops, mobile devices, and even through the web on public computers. Changes made to those documents will be synchronized so the changes will show up on the other devices automatically. You can use it as a personal server with a single account or it can be used as an organization's file store with multiple accounts. Users can be assigned to groups, and different groups can have access to different sets of files. You can also share files with someone outside your organization who doesn't have an account on owncloud by sending them a special link they can use to access the file. There are also a number of plugins that can be loaded to enable other functionality; for example you can synchronize calendars and addressbooks between your devices using owncloud. In this document, I'll explain how to get a recent version of Owncloud running on a new RimuHosting Debian VPS. To get a new VPS to host Owncloud, go to https://rimuhosting.com/order /v2orderstart.jsp. 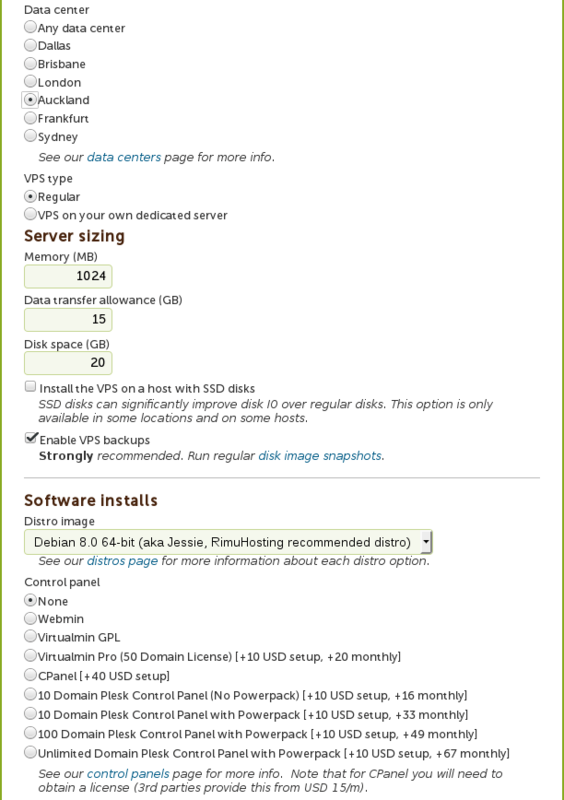 Get started by selecting the budget VPS, and configure the resources from there. Name it after the domain name you will use (this could be changed later if necessary.) You can see I have selected to host my server in Auckland, with 1024MB of RAM (which should be sufficient for a small to medium load owncloud server), and 20GB of disk space. You should adjust the disk space to cover the file storage size you think you will need. Keep in mind that this disk size can easily be increased later via your control panel, if needed. The other settings can be left on their defaults. Once the VPS is set up, you will get a welcome email listing the "Primary IP". Use this to set up DNS to point the domain subdomain you selected to the owncloud server. In this case I've logged in to my RimuHosting control panel, and under "Manage your DNS," I set an "A" record, owncloud.alexking.nz to point to 103.16.181.43. That is the IP address from the welcome email. If your DNS is with a different provider, you will need to arrange for that record to be entered into their system. 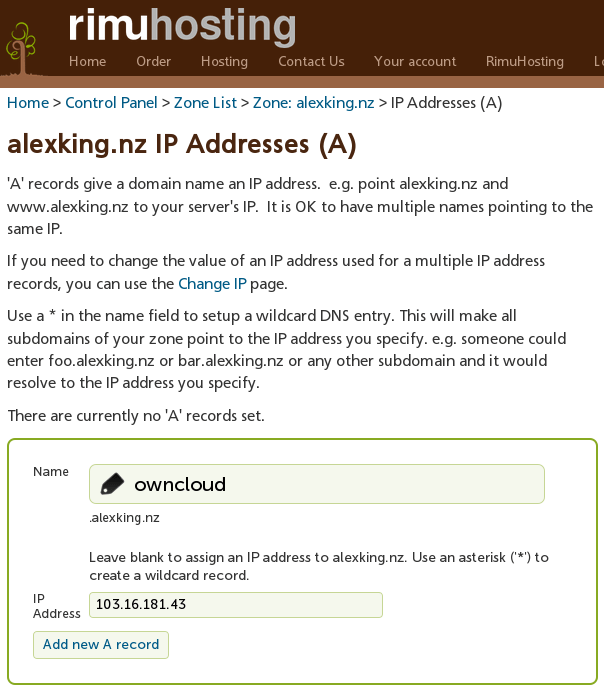 Test the DNS record by opening a terminal or command prompt and typing "ping owncloud.alexking.nz" (replacing owncloud.alexking.nz with the DNS name you just set up.) If your DNS is with RimuHosting, the ping should work immediately. If it is with another provider, it might take up to 30 minutes or more to become available. If you have trouble with this step, you could log in to RimuHosting's Live chat and ask for assistance. Note we are asking for the postfix email server to be installed in addition to owncloud. The command will also load a host of other supporting software including the Apache webserver and MySQL datbase server. The download will take a minute or so. You will be prompted for the password again once you have entered those lines, enter the mysql password you set above. What is the domain name that you want the SSL certificate to cover. This will be used for the certificate *file* name. Now Owncloud is running at your url (https://owncloud.alexking.nz/ in my case.) Connect to that with your web browser, accept the self-signed certificate, and you will see the owncloud setup screen with a warning about SQLite. We want to use MySQL instead of SQLite, so click the "Storage & Datebase" dropdown, and select "MySQL/MariaDB". This will reveal 4 fields which need to be filled in. In the "Database User" field, enter "owncloud". In the "Database password" field, enter the password you created above. In the "database name" field, enter "owncloud" again. The final field can be left at "localhost." Owncloud setup should take less than a minute, and you will be taken to the welcome screen. You can explore the links to client applications on the welcome screen, or close that and start working with the web interface. There are a few post install setup tasks that should be done at this stage. First, under your username dropdown menu in the top right, select "Personal". This takes you to your profile, where you can set your email address. This is used if your password ever needs to be reset. Next go to the "Admin" menu, and select email server. The send mode can be left as is, but you will need to fill in an email "from" address there for the system to be able to send out email notifications. You can most likely use the same email address there if you want to. You owncloud server should now be completely set up and ready to use. If you encounterd any problems while installing owncloud on a Rimu VPS you can get help by connecting to live chat or lodging a support ticket. This entry was posted in HOWTO, Rimuhosting and tagged debian, install, linux, owncloud, vps. Bookmark the permalink.